Democrats and Republicans are campaigning past each other. Democrats and Republicans are running against each other, of course. But they're really campaigning past each other -- playing out entirely different campaigns, animated by disparate issues and, led by President Donald Trump, sometimes distinct sets of facts. Both sides could be right -- or extremely wrong. It's clear that campaigns right now are less about swing voters than they are different calculations about what will motivate people to vote. Democrats are plotting a two-week final push focused on health care, confident in their take on the No. 1 issue popping up in campaign messaging coast to coast. Trump is trying to change that subject entirely, seeking to make the midterms all about a migrant caravan he is, without evidence, blaming on Democrats. The vastly different plays are evident in the campaigns for Senate in Texas, where Trump's rally with Sen. Ted Cruz grabbed headlines. It's also obvious in the race for governor in Florida, where Hillary Clinton will raise money behind closed doors -- no public event was scheduled -- for Democrat Andrew Gillum on Tuesday. Both sides think they're right and think their voters will respond. The truth is that nobody knows -- and that this election is volatile in a different sort of way than previous contests with national implications. President Trump is being honest, open and transparent about the political value he sees in the caravan of migrants fleeing violence and poverty in Central America. 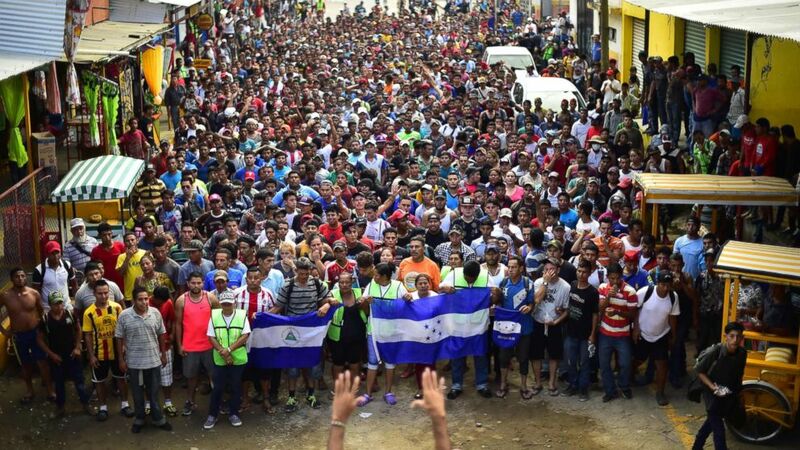 Not only is he not mincing words, he's said plainly that the caravan -- and strong pictures of the caravan -- could be good for Republicans this fall, and so he wants to talk about it as much as possible. Of course, it's an issue -- immigration and national security are important issues in basically any election, any time. But the president isn't talking about legislation he's worked on or that the party has proposed. He isn't talking about new diplomacy or plans to stem the insecurity and gang violence at the source in Central America. Republicans have largely swung and missed on immigration reform since the president took office. What Trump is trying to do is deflect from other issues that voters said they also care about, like health care, wages and corruption, because those issues are not playing well. To a point, that's fair. But alarmist, racially charged, and, arguably, a fear-mongering tactic for political gain should be viewed critically. The president's only real idea -- to close and militarize the border -- is probably illegal. The National Guard or other military officers could assist the Border Patrol, but again, that's a real conversation that we're not having. Sen. Kamala Harris wants you to know that her trip to Iowa is all about 2018. "I'm really focused on the next 15 days. You can focus on whatever you're thinking about," Harris said in response to a question from ABC News on Monday about her presidential aspirations. The California Democrat is in the midst of a two-day campaign swing that will take her across central and eastern Iowa, and while the events may be to boost her party's candidates this cycle, her rhetoric suggests she has her eyes on the future. 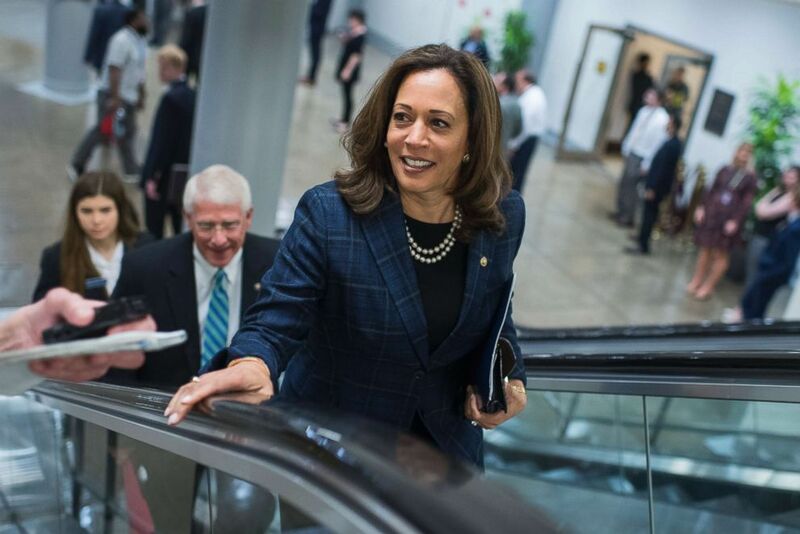 (Tom Williams/CQ Roll Call/Getty Images) Sen. Kamala Harris, D-Calif., makes her way to the Senate Policy luncheons at the Capitol, May 22, 2018. "This moment at some point will pass. We will get beyond this, I promise you," she told a crowd in downtown Des Moines Monday evening. Harris has four campaign stops slated for Tuesday in eastern Iowa: Cedar Falls, Waterloo, Iowa City and Cedar Rapids, as she looks to boost Democrats in the Hawkeye State in the campaign's closing weeks. President Donald Trump is scheduled to make remarks at White House state leadership day for officials from Alaska, California and Hawaii at 2 p.m. In the evening, he gets a briefing from, and then has dinner with, senior military leaders. Vice President Mike Pence will speak at the National Space Council meeting at 11:30 a.m. EDT. The NSC is expected to vote on recommendations to Trump’s Space Force, which would be recognized as the sixth branch of the armed forces. Hillary Clinton hits the campaign trial for Tallahassee Mayor Andrew Gillum, the Democratic hopeful in Florida's gubernatorial race. This is event is closed press. Georgia's Secretary of State Brian Kemp and Democratic challenger Stacey Abrams battle it out in their first gubernatorial debate before midterm elections. Georgia’s gubernatorial race has garnered national attention for both Abrams' bid to become the nation's first African-American female governor and for Kemp's alleged voter-suppression tactics. The Note has a new look! Download the ABC News app and select "The Note" as an item of interest to receive the day's sharpest political analysis.The Note is a daily ABC News feature that highlights political analysis of the day ahead. Please check back Tuesday for the latest.